The founder of an organization that promotes the human/animal bond to help treat mental illness, will lead a conversation on "Embracing Hope for Mental Health" in Chattanooga on Tuesday. Jeff Fink, the founder of an organization that promotes the human/animal bond to help treat mental illness, will lead a conversation on "Embracing Hope for Mental Health" in Chattanooga on Tuesday. › When: 5:30 p.m. Tuesday, May 1. › Where: The Camp House, 149 E. M.L. King Blvd. Jeff Fink says his struggles with severe and persistent anxiety and depression began when he was a teenager. When traditional treatments alone weren't providing relief, he looked for a more holistic path. Fink began training a golden retriever named Earl to be his mental health service dog, adding to his whole-person approach to wellness. 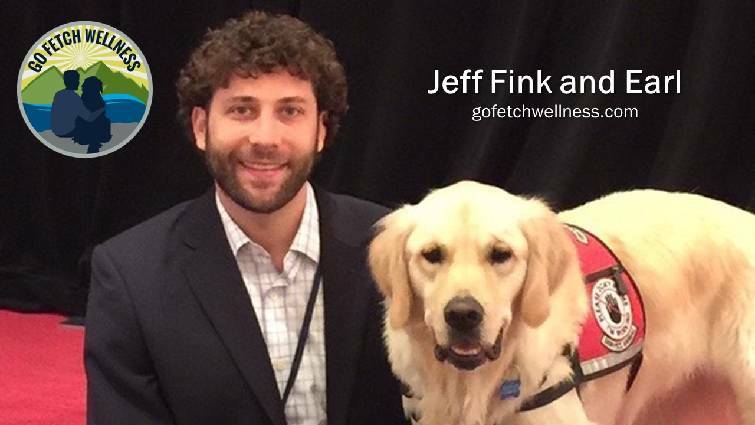 Over time, Fink realized the positive effect Earl had on himself and others, and he launched Go Fetch Wellness, which introduces others to how the human/animal bond can support their journey through mental health challenges. Tuesday's event will include inspirational stories from Fink and others featured in a documentary, "Beyond Silence," from Be Vocal: Speak Up for Mental Health, an initiative aiming to shatter the silence and stigma associated with mental illness. The documentary is executive-produced by pop singer Demi Lovato, who came forward in 2015 about her struggles with bipolar disorder. Fink, who is based in Atlanta, is one of three subjects profiled in the film, each of whom has been been diagnosed with a form of mental illness (bipolar disorder, schizophrenia and depression/anxiety). Their message is that speaking up about their mental health challenges was the key to living well. Following the screening, Fink will speak briefly about his experience with mental health recovery, treatment challenges, stigma and support. "Having lived for the last 18-plus years with treatment-resistant major depression and severe anxiety, I realized the limitations in traditional mental health treatments and modalities," he says in a news release. "For many, medications and psychotherapy provide substantial relief. For others, like me, they don't do enough." Others from the community also will take part in an informed conversation designed to share expertise, experience and hope for mental illness, and offer information on local resources for help. The panelists, who are local experts in holistic approaches to maintaining mental health, also include Elizabeth Kabalka, executive director for the Center for Mindful Living, who will speak on the benefits of mindfulness individually and for the community; Dr. Lee Solomon, a psychiatrist with Behavioral Health Associates who specializes in panic and anxiety disorders in adolescence through adulthood; and Tabi Upton, who has worked with families facing all types of life challenges, counseled military children living outside the U.S. and met with inmates in a local jail. Her column, "Mind Matters," ran in the Chattanooga Times Free Press for 13 years. Scheduled to begin at 5:30 p.m. at The Camp House, the event is the kickoff for Mental Health Awareness Month activities in the Chattanooga area.